The interior of a car takes a beating when it is used as a diner, office, briefcase, and waste paper basket and storage locker. Morning coffee splatters on the dash board and crumbs accumulate at the drivers feet. Food wrappers collect on the back seat floor and the dirty laundry left in the trunk will make its presence known after a while. Ever wonder where all those post it notes end up? When you clean out under the seat you will find most of them. 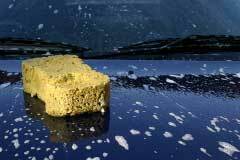 Most people keep their house neat, orderly and smelling good so why not do the same for your car? Besides your home, for most people, your car is your next biggest investment. Vacuum your car out regularly. Unless you have a foot mat outside your car door, you will track in anything that sticks to the bottom of your shoes. After a while, the foot areas of your car will resemble a gravel pit. While the gravel and dirt material may come in handy in the winter, store it in a bucket instead of on the floor of your car. Vacuum the console as it seems to be a magnet for crumbs. After a while the crumbs make your change stick together and you can't use the quarters for the parking meter or the vacuum at the car wash. Seats for some reason pick up any crud from the bottom of any shopping bags and if you have teeny tiny tots, their feet tend to hit the seats more often than their seats hit the seats. Spots and stains can be removed with a spot remover. Most car care centers will have some specialty products to do the job, but household products will also do the trick. Glass cleaner will remove coffee stains. Grease stains can be removed from carpet and upholstery by rubbing on paint thinner with a clean cloth, then cover the stain with salt. After the spot has dried, vacuum the area. If the stain is still fresh (wet) instead of paint thinner and salt, cover the stain with cornmeal and let stand overnight and then vacuum. If you're lucky pen leaks, hairspray will get that pesky ink stain out and if you use your car as a beauty parlor on wheels you probably have hairspray in the car already. In the case of car sickness, mop up as much of the goo as possible then dilute the area with club soda or a mixture of baking soda and water. Let the area dry, then vacuum the residue. Blood stains are a little more challenging but if covered immediately with a paste made of dry laundry starch and cold water, you have a fighting chance. If on your way home from the grocery store your keg of beer breaks open and spills on the carpet, mop the liquid up then dilute immediately with cold water. For general carpet or upholstery cleaning, or for cleaning after diluting a stain, mix a gallon of hot water, a half cup of dish detergent and a cup of white vinegar. Work the mixture into the carpet with a hard bristle brush and let stand for about 30 minutes. Blot the area until dry with towels or absorbent cloths. If your carpet edges begin to fray, paint the seams and edges with liquid resin to hold the fibers in place. The liquid product can be found in fabric and crafts stores. If you want to minimize static in your carpet, mix five parts of water and one part liquid softener. Spray your carpet lightly with the mixture and eliminate the static electric shock you get when you touch metal objects.